Meatless Monday seems to be growing in popularity and meat lover that I am, I’ve been avoiding it like the plague! But now that the holidays are over and I’m back to eating relatively healthful food day to day but…I still have pants in the closet that I can’t fit into anymore! While I’m well aware that eating veggies only once a week isn’t going to make a significant impact it’s certainly a step in the right direction. It also starts off the week with a kick to my immune system and sets the stage for eating good wholesome food throughout the rest of the week. So, meatless Monday it is! Bacon bits just wouldn’t have been right so I went with the garlic “croutons”. These are not actually croutons but simply pan toasted chopped garlic. These yummy little tidbits pack a punch, are easy to make and great as a garnish for soups, salads, or even cooked vegetables. I use a little dairy in both of these recipes. 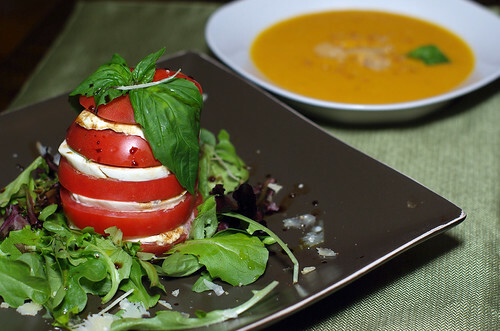 If you avoid dairy try making the tomato stack with firm tofu in place of the mozzarella cheese and unsweetened almond milk would be very good in the soup. Note: The soup is best if made the day before and it also makes this an easy dinner to prepare on a Monday night! Preheat the oven to 375. Line a baking sheet with foil or parchment paper and spritz with cooking spray. Quarter the squash leaving the seeds intact and place skin side down on the baking pan. Spritz the squash with a little of the cooking spray and season with salt and pepper. Very carefully cut roughly ½ inch off the top (pointy end) of the garlic head. (The idea is to expose as many of the cloves as possible without removing too much of the meat.) Place the garlic on a piece of foil then drizzle a tablespoon of olive oil evenly over the top. Season with salt and pepper then bring the edges of the foil together over the top of the garlic head to seal. Now place the baking sheet into the oven then place the neat little package of garlic on one of the corners of the baking sheet alongside the squash. Bake for 45 minutes, carefully remove the garlic and bake the squash 15 minutes more. Remove the squash from the oven and set aside to cool. While the squash is cooling add 1 tablespoon of olive oil to a 4 quart sauce pan and place over medium heat. Add the onion and ginger and cook 3-5 minutes, stirring occasionally until the pan is sizzling and the onion has begun to become transparent. Lower the heat to low and continue cooking, stirring occasionally until the onion turn golden, about 10 minutes. When the squash have cooled enough to work with remove the skin and the seeds. (If they are not too burned; save the seeds for garnish or to munch on later.) As you work, place the cooked squash pieces into the pan along with the onions continuing to stir once in a while. Carefully remove the garlic cloves from the head and gently squeeze the roasted meat out of the skin, adding this to the pan with the onions and squash. When you have all of the squash and the garlic added to the pan, add 2 cups of the broth, raise the heat to medium high and cook stirring often until most of the broth has evaporated. Stir in 3 more cups of broth and reserve the remaining cup for later. Allow the soup to just come back to a boil then remove it from the heat. With the pan off of the heat, use an immersion blender to carefully puree the soup while adding the kefir a little at a time. 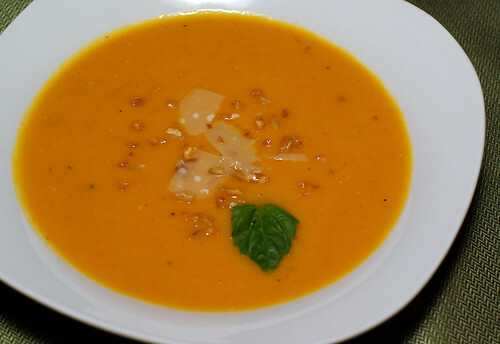 Blend until all of the ingredients are well pureed and the soup has become silky smooth. Check the flavor and add salt and pepper if needed then return the pan to the heat and cook stirring often until heated through. 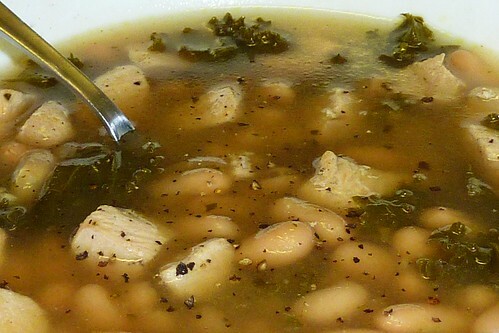 If the soup is too think stir in the reserved cup of broth to bring back the consistency. Serve garnished with toasted garlic “croutons” and just a few shavings of parmesan cheese. Slice enough off the bottom of each tomato to allow it to sit flat. Working one tomato at a time and slicing horizontally cut each into five equal slices including the top. Position the tomato slices in such a way that you can easily reassemble them into the original tomato shape. Starting at the bottom, sprinkle the first slice with a little kosher salt & pepper. Now add a slice of mozzarella and a leaf or two of fresh basil, then drizzle this with a little of the balsamic vinegar and olive oil. Set the next tomato slice on top and repeat the process until the tomato is reassembled with salt and pepper, cheese, basil, and oil and vinegar between each slice. Before putting the top back on the tomato carefully cut out the stem, then after placing the top back on the tomato, drizzle a little more oil and vinegar into the hole left behind. Pinch the top of f of a branch of basil and place the stem end into the same hole so that it appears to be leaves on the tomato. 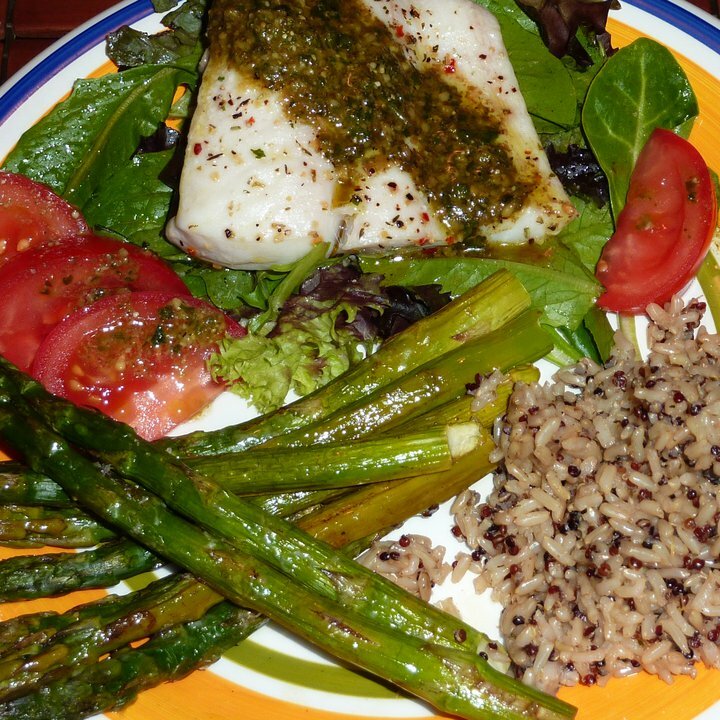 To serve, spread a serving of mixed baby greens on the plate then carefully set the tomato in the center. Sprinkle the greens with a little of the oil and vinegar, then garnish with toasted garlic “croutons” and just a few shavings of parmesan cheese. Warm a small non-stick pan over medium heat and add the olive oil. When the oil begins to shimmer lower the heat to low and stir in the garlic. Stirring very often to avoid burning, cook until all of the garlic has become evenly cooked and golden brown. Using a slotted spoon, remove the garlic to drain on a paper towel much as you would with bacon. Sprinkle with a pinch of salt and shake the paper towel a little to distribute and to spread out the garlic so the pieces don’t stick together. Allow “croutons” a minute or two to dry before serving. I was recently asked to post some of my easier recipes and this is definitely one of them. With 10 minutes of prep, you can put the game hens in the oven then sit down and relax for ½ an hour. Then, by the time you slice and cook the cabbage the hens should be coming out of the oven. Viola! Your plates will look like you worked very hard but you will still have enough energy left to enjoy the compliments. I know some of you are a little intimidated by Game Hens but they are really just little chickens. To split them just set them, breast side up, on the cutting board and take a knife or kitchen shears and carefully cut, lengthwise, through the center of the top of the bird. Once the breast is cut through you can spread open the cavity a little, sort of like a book, then cut down either side of the backbone to remove it. That’s all there is to it! You should now have two even halves. Notes: For the cabbage, I like to let it cook without stirring for more than 5 minutes at a time. This allows the cabbage to brown a little and makes it taste almost like it was griddled on a restaurant flattop. Just be sure to shake the pan at least every 5 minutes to make sure it doesn’t get too brown. Pre-heat the oven to 425 degrees. Combine the lemon juice, parsley, oregano, garlic, and salt & pepper in a medium sized mixing bowl. Whisk the olive oil slowly into the bowl until all of the oil is added then continue whisking until the liquid begins to thicken. Dredge each Cornish hen half in the liquid rubbing carefully with your hands to cover all sides. Place the hens in a 9” X 13” glass baking dish. Dredge the potatoes in the remaining liquid and distribute them around and in-between the Cornish hens. Drizzle or sprinkle any remaining liquid or herbs over the hens and add sprinkle more of salt & pepper if desired. Place in the oven and bake 1 hour. Carefully remove and allow to rest 15 minutes before serving with cabbage. 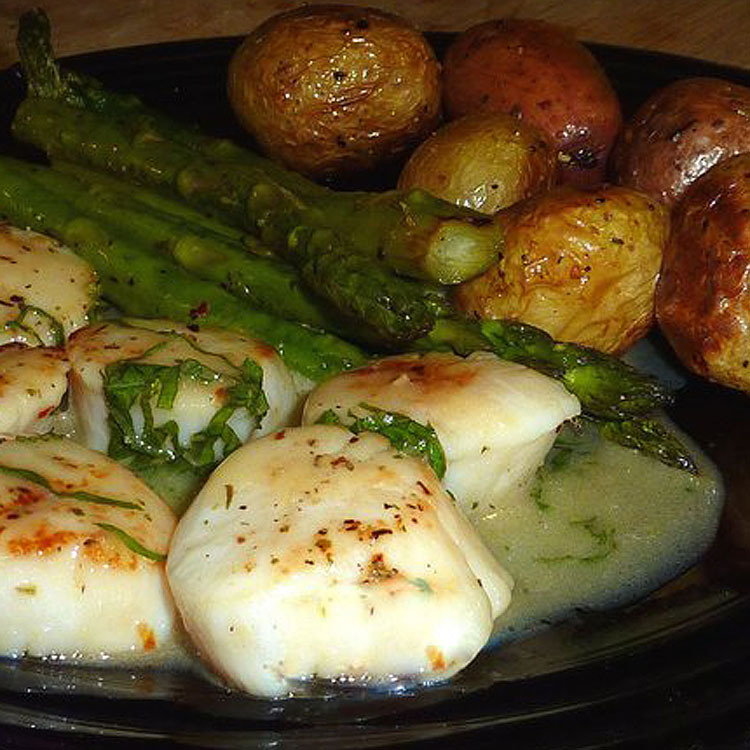 In a large sauté pan over medium heat, warm 1 tablespoon of olive oil until shimmering hot. Saute the onions and garlic for about 1 minute before adding the remaining ingredients. Cook, stirring only occasionally, until cabbage is just tender through and through…about 20 minutes. 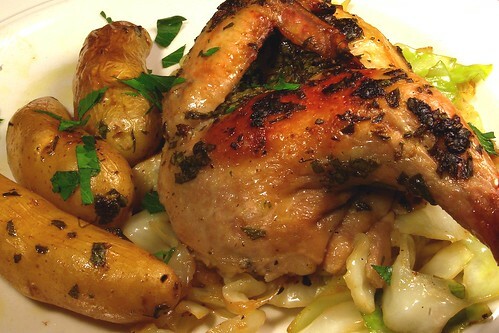 Set aside until the hens are finished then serve the cabbage as a bed on the plate, with Cornish hens placed on top.